Mark Zuckerberg is about to make $2.3bn from a sale of shares - as Bill Gates gives arguably the lamest Secret Santa present ever. It’s been a good month for Facebook: not only has founder Mark Zuckerberg come up with what will surely be the social media sensation of 2014 – the ‘sympathise’ button – but the company has also smashed its way into the S&P 500. A reflection of the fact that its share price has more than recovered since its disastrous IPO (hitting a record $55.05 on Wednesday). What better time, then, to do its first share sale? Zuckerberg said yesterday afternoon (UK time) that between himself and the company, about 70 million shares in Facebook will go up for sale, with Zuckerberg selling 41 million and the company issuing 27 million new shares. Zuckerberg is, apparently, planning to use the $2.3bn he gets (based on current share price) to pay taxes on a stock option conversion for which he’ll need another 60 million shares, while Facebook will use its $1.5bn‘for working capital’. Which, we can only assume, is Facebookese for ‘more ludicrously over-priced takeover offers, a la our failed attempt to buy SnapChat for $3bn’. Meanwhile, over in Seattle, Microsoft chairman Bill Gates – the Mark Zuckerberg of the 90s – has become the proud giver of what is almost certainly the worst-ever Secret Santa gift. 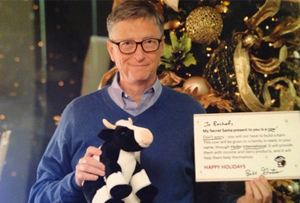 Gates took part in the Reddit Secret Santa gift exchange programme (last year 44,000 people took part), and decided to spent $500 (£305) on a cow from charity Heifer International, which was then donated to ‘a family in need’. Now, we’re sure Reddit user NY1227, the gift’s recipient, is delighted a family in need has received its much-needed cow. But really, thinking about it, that cow didn’t actually go to NY1227, did it? It went to the family in need. NY1227 got a stuffed cow and a certificate. Which, given the zillions of dollars Gates makes every second, was probably a tiny bit disappointing. Surely Gates could have donated the cow AND given NY1227 something on her Reddit ‘wishlist’? What would have been really nice would have been, say, a yacht. Or a car. Or a mansion. Or, at the very least, the most up-to-date version of Microsoft Office. Also, ‘I’ve donated a cow to a family in need on your behalf’ doesn’t exactly say ‘I put a lot of thought into my gift’, does it? Gates could have donated a cow to a family in need on almost anyone’s behalf. Reddit Secret Santas are supposed to put research into their gift. Gates could easily have dug the cow out of his ‘regifting’ cupboard and stuck it in the post, and NY1227 wouldn’t have had a clue. For her part, NY1227 was gracious: ‘I was so excited, the cause seemed really worthy and amazing, and it is the season of giving,’ she wrote (before adding ‘just not to me’ in her head). At least she got her own back in one sense: at the end of her thank you letter to Gates, she added ‘ps. Sorry for the Apple iPad on my wishlist, that was really awkward’. As all Redditors would put it: lol.